Note: Link to free photos of all riders is below. 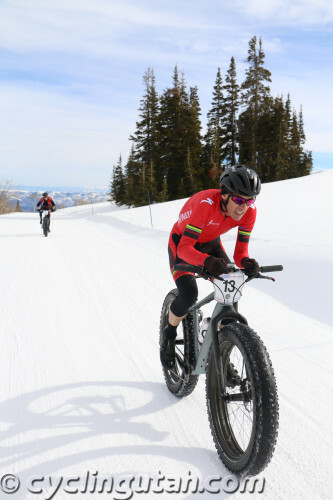 February 14, 2015 – Ned Overend (Specialized) and Amanda Miller (Boulder Sports/YogaGlo) won the Pro Men and Pro Women categories at the Inaugural USA Cycling Fat Bike National Championships at Powder Mountain, Utah. 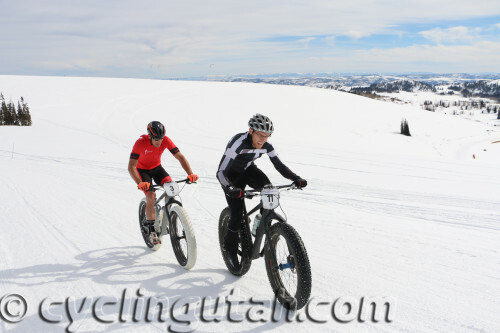 Held on a beautiful, sunny, but windy day, Fat Bike Nationals featured a 6.1 mile rolling course with a few good climbs. More of a fitness course than a technical one, it challenged the riders as most looked tired at the end of their races. The professional categories rode three laps, while the amateur groups did two. 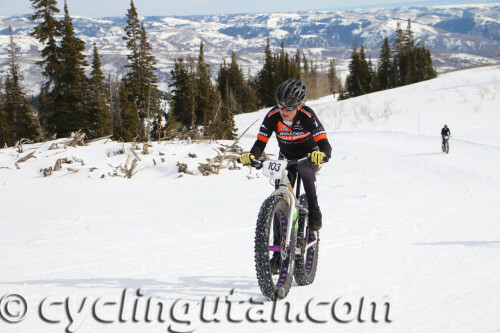 A number of Utah riders were crowned National Champions in their respective age or division categories. Anders Johnson had the fastest lap of the day and went on to win the Junior 15-18 Men's title. Jason Sager was all smiles after winning the Singlespeed division. Zach Harvey of Morgan, Utah won the men's 19-29 National Championship. Chris Stuart of Park City, Utah won the Masters Men 30-39. Andrew Kulmatiski of Logan, Utah won the Masters Men 40-49 race. Rick Morris of Park City, Utah won the Masters 60-64 jersey. Joel Quinn of South Jordan won the Masters Men 70+ title. Debbie Mortensen of Eden, Utah won the Masters Women 30-39 National Championship. Numerous other Utahns took home medals too.